Introduction: Brown Sequard syndrome resulting from compression due to an epidural hematoma is a relatively rare occurrence, more so with a spontaneous history. We report one such case. Case Report: We present a 65yr old female presenting with hemiplegia with contralateral anesthesia. Magnetic resonance imaging showed a hematoma in the epidural space in the C3-C4 region. She underwent an open door laminoplasty for evacuation of the hematoma. Following surgery the patient responded rapidly and currently at 18 months follow up she is neurologically grade 5/5 with normal sensations. Conclusion: In the emergency room when a patient is clinically diagnosed as a case of Brown Sequard syndrome it is important to ask for an MRI scan of the cervical spine. Hematoma in the cervical epidural space should be considered in the differential diagnosis of Brown Sequard syndrome especially in the elderly with history of doubtful trivial trauma. 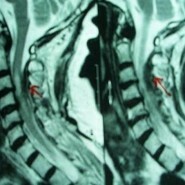 Keywords: Cervical epidural hematoma, Brown Sequard syndrome, Magnetic Resonance Imaging. 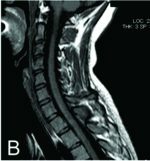 How to Cite This Article:Roy SP, Agrawal N. Brown Sequard Syndrome Secondary to a Spontaneous Cervical Epidural Hematoma – A Rare Entity. Journal of Orthopaedic Case Reports. 2012 Oct-Dec;2(4):23-25.Available from: http://www.jocr.co.in/wp/wp-content/uploads/2013/01/jocr-oct-dec-2012-7-Brown-Sequard-Syndrome-Secondary-to-a-Spontaneous-Cervical-Epidural-Hematoma-2.pdf.